If you’re looking for a new neighborhood that’s out in the beautiful countryside, yet close to the city, check out Riverside at Oak Ridge. As its name suggests, Riverside is a growing home community near Haw River. A luxury community, Riverside offers many amenities. In an excellent location with top schools and close proximity to shopping, dining, and entertainment, there’s something for everyone to love about Riverside. And there are available, ready-to-build new home lots in Oak Ridge, NC, now. Enjoy all the benefits of living in Riverside Community. Natural setting. Riverside provides convenient access to parks, golf courses and more. Drive along the country roads between rolling fields and lush forests and know you’re in a good place. If you’re tired of crowds and traffic and city noise, build your home in a community where you can escape all of that. Go back in time and experience life like it was before people got in such a hurry. Convenient location. Even though Riverside is out in the country, it’s just a short drive to reach all of the conveniences of Kernersville and Greensboro. A reasonable commute to work, shopping and dining close by, and plenty of things to do whether you’re looking for outdoor or indoor entertainment. Grocery stores, pharmacies, convenience stores and more are just around the corner. You can have both convenience and beauty in your life. Premier custom builders. Some of Greensboro’s best builders are designing and constructing the new homes in the Riverside community. R&K Custom Homes puts your needs and desires into a home design that encompasses all of the features and details that you want. Your R&K original home will be truly unique, reflecting your very own style and personality. Quality craftsmanship and the finest materials go into every R&K home. Pool and tennis courts. And the icing on the cake is the resort-like amenities. Play a match on the tennis court or take a dip in the pool and you’ll feel like you’re on vacation every day. Views of the trees and rolling fields are a gorgeous backdrop to these activities. Such a desired neighborhood with beauty and convenience fills up fast. Home lots in Oak Ridge, NC, are selling quickly as more residents of Greensboro and the surrounding areas look for a community like Riverside, a beautiful escape from city dwelling. Just beyond the neighborhood itself there are parks, golf courses, shopping centers, and restaurants. Medical facilities and emergency services are close by and the schools in the area are top notch, both public and private. 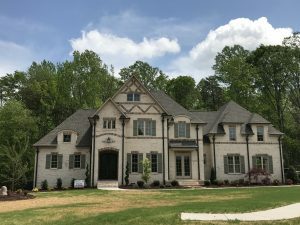 If you’re ready to find a new community where you can build your home your way, on a piece of land you choose, call R&K Custom Homes: (336) 643-3503.